Everyone knows how important pizza is. That's why suburban Chicago police officers went above and beyond their call of duty. 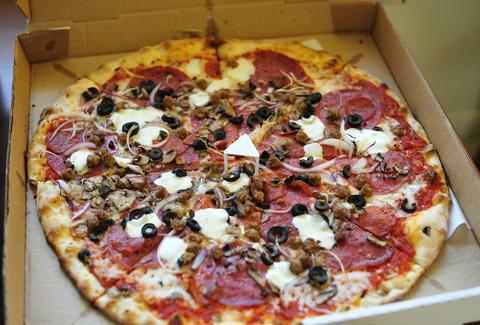 An Oswego, Ill. police officer valiantly delivered a pizza after officers arrested the pizza guy and his passenger on drug paraphernalia charges following a traffic stop that resulted in the discovery of a marijuana pipe in the vehicle on Jan. 25, the Chicago Tribune reported. Police told the Tribune they pulled over the driver after he drove through a parking lot to avoid a red light, and rather than book them and call it a day, the two officers noticed the 'za in the back seat, and decided their job wasn't quite done. "The pizza was already paid for, and the delivery location was within a few blocks," Oswego Police Chief Jeff Burgner told the paper. "They decided one should go ahead and make the delivery." Once they got the pie to the surprised, hungry resident, the police wrote about it in a Facebook post saying, "A confused resident accepted the pizza, and was very glad that the police were there to deliver the pizza, rather than talk to them." Regardless of what you think of the police, you gotta admit this was one of the coolest gestures officers have ever done (besides, you know, protecting people and helping lost tourists find landmarks). And if this should ever happen again, maybe they'll step their game up more and bring a sixer of beer. Pete Dombrosky is an Editorial Assistant at Thrillist and he thinks people would have a much better opinion of the police if they always showed up with pizza. Help him salute the 5-O on Twitter.